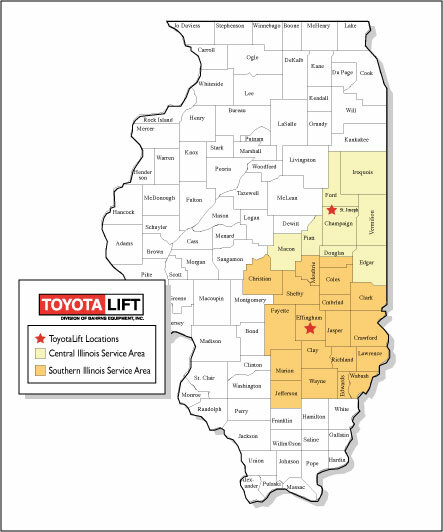 Bahrns ToyotaLift of Illinois has two locations; The corporate office in Effingham, Illinois and our branch facility located in St. Joseph, Illinois. Between the two the service area coverage consists of the eastern border from Iraquois county to Wabash county and as far west as Jefferson county up to Christian county. Between the two servicing locations we have the knowledge, experienced staff and man power to service your locations on site or in our own facilities if need be. 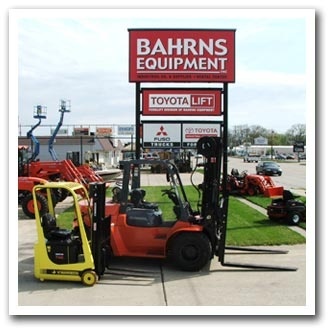 Bahrns Equipment ToyotaLift of Southern Illinois has its roots in the company’s near half century of serving the forklift and materials handling needs of hundreds of loyal customers throughout Central and Southern Illinois. Business owners and managers of everything from light industrial plants and small factories to huge warehouses turn to us for our enormous product range and dependable service. From warehouse supplies to forklifts. More importantly, they turn to us for advice because they know our customer representatives have decades of experience behind them: experience they freely share to give them the best possible service with forklifts, equipment, and supplies. The service areas for our Effingham location are the counties of; Jefferson, Wayne, Edwards, Wabash, Lawrence, Richland, Clay, Marion, Fayette, Effingham, Jasper, Crawford, Clark, Cumberland, Coles, Moultrie, Shelby and Christian. For over thirty years, the experienced sales team at ToyotaLift Division of Bahrn’s Equipment has been specializing in dealing in forklifts and huge catalog of material handling equipment and warehouse supplies. Whether you are interested in a investing in only one Toyota forklift, looking to purchase an entire fleet, or in need of warehouse supplies and material handling products, the expert staff at Bahrns promises that we will work with you to ensure you utilize your funds to their highest potential and make a purchase that will leave you feeling satisfied. The service area for our branch in St. Joseph include the counties of; Macon, Piatt, Douglas, Edgar, Vermilion, Champaign, Ford, and Iroquois. Although talking to our professional team is your best resource in selecting a forklift, Toyota offers an online resource tool to help you in self-selecting a forklift for your needs. Click here to be directed to the self-selection tool.